Note: A Guardian license is required to make full use of this feature. For more information, refer to your Smoothwall representative. The Safeguarding Notifications page provides you with the ability to send the Safeguarding Full report, filtered as required, to specified users or groups. For more information about the Safeguarding Full report, see About the Safeguarding Full Report. You can also configure instantaneous alerts, sent via email or SMS, to immediately notify the nominated persons of a Safeguarding breach. What's the Difference Between an Emailed Notification and an Instant Alert? You use the email notification to receive the Safeguarding Full report, filtered as required, on a regular, set basis. This can be for all users or groups and all rulesets, for a single user or group and single ruleset, or a combination of both. With Multi-Tenant licensed Smoothwalls, the email notification is also tied to the tenant that the user or group belongs to. Whereas an instant alert sends an email or SMS message to nominated persons as soon as a Danger-level Safeguarding breach is detected. Note: When multiple breaches against the same User / Group, Ruleset, and Email group combination are detected, the instant alert is only sent every ten minutes, so as not to bombard the Safeguarding Officer with messages. The Smoothwall communicates with an external SMTP server. Before configuring individual notifications, you must configure the connection to the SMTP server. You configure the SMTP details in the Reports > Settings > Output settings page, section SMTP (Email) Output System — see Configuring Report and Alert Output Settings. You must configure email groups for those specified users who receive Safeguarding notifications. You do this in the Reports > Settings > Groups page — see Configuring Alert and Report Groups. You must configure email groups for those specified users who receive instant Safeguarding alerts. You do this in the Reports > Settings > Groups page — see Configuring Alert and Report Groups. The Smoothwall communicates with an external email-to-SMS gateway. Before configuring individual alerts, you must configure the connection to the gateway. You configure the connection details in the Reports > Settings > Output settings page, section Email to SMS Output System — see Configuring Report and Alert Output Settings. Tip: If you require an email notification as well as a instant alert for the same User / Group and Ruleset combination, you can add them to the same notification configuration without having to add a separate one for each notification type. 1. Go to Reports > Safeguarding > Notifications. 3. Specify the username or group (User / Group) to monitor for Safeguarding breaches. Leave the default as Everyone to report on all users (the emailed notification will contain the username if Everyone is specified). 4. If this is a Multi-Tenant licensed Smoothwall, you have an additional parameter — Tenant. Typically, you would leave this option as All tenants. However, there may be times where a username or group name is used in multiple tenants, for example, john.doe existing as separate users in two tenants, or a common group name across tenants, such as Year 1 in schools. In those instances, you can narrow the User / Group alert parameters by specifying the Tenant name. For more information about the Multi-Tenant feature, see About Multi-Tenant Managed Services. 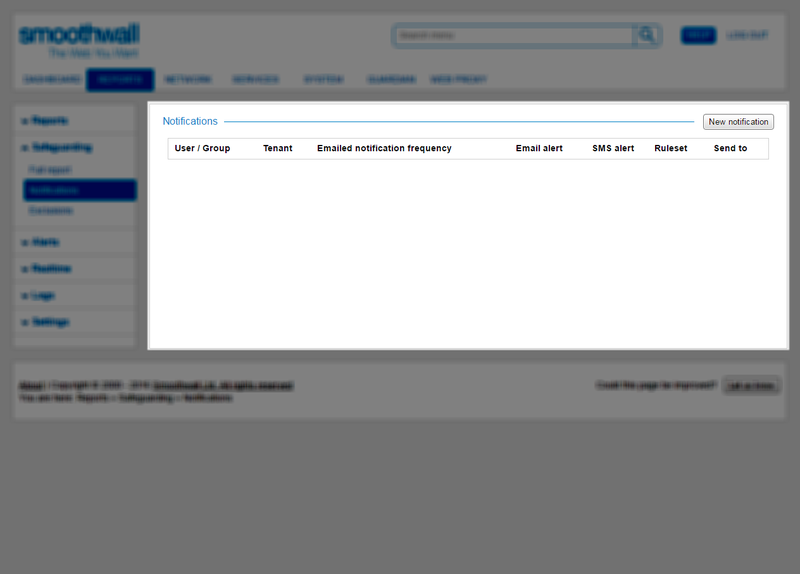 • Daily — Receive an email notification for the User / Group and Ruleset combination on a daily basis. The report content is for yesterday. • Weekly — Receive an email notification for the User / Group and Ruleset combination on a weekly basis. The report is always sent on Monday, irrespective of the day this notification was created. The report content is from the previous Monday-Sunday time period. • Monthly — Receive an email notification for the User / Group and Ruleset combination on a monthly basis. The report is always sent on the 1st of the month, irrespective of the day this notification was created. The report content is from the entire previous month. 6. To create an instant alert for this User / Group and Ruleset combination, choose whether to send an Email alert or an SMS alert. You can ignore this option if this is an emailed notification. Note: When multiple breaches against the same User / Group, Ruleset, and Email group combination is detected, the instant alert is only sent every ten minutes so as not to bombard the Safeguarding Officer with messages. 7. From the Select Safeguarding ruleset drop-down, select the relevant ruleset. To send notifications for all rulesets, choose All. You cannot create a notification containing more than one ruleset unless you choose All. For those notifications where the User / Group and Email group are the same, but the Ruleset is different, you must create a separate notification for each ruleset. For a detailed description of the Safeguarding rulesets, see What is a Safeguarding Ruleset? 8. From the Send notification / alert to email group drop-down, select the relevant email group. If the required email group does not appear, use the email groups link at the bottom of the dialog window to add additional groups. It should be noted however, that this takes you to the Reports > Settings > Groups page so you will lose any configuration previously entered in the New notification dialog. 2. From the Notifications table, locate and highlight the relevant notification. 4. Adjust the configuration as required. For a detailed description of each setting, see Adding a New Alert and Notification.